Here's another interesting and easy drop cookie recipe for Peanut Butter Cranberry Drops. What makes it interesting is that is pairs peanut butter with cranberries. What makes it easy is that it all starts with a package of refrigerated peanut butter cookie dough. Can't get too much simpler than that! This recipe calls for iced cookies - which complements the cookie flavors perfectly, but of course you can always choose to leave the icing off. Or, if you have picky eaters, ice some and leave some plain - the choice is yours. But be warned, the icing is made with cranberry juice and it really adds to the flavor the dried cranberries give to these peanutty drop cookies. In a large resealable plastic bag combine the cookie dough, peanuts, cranberries and flour; seal the bag. Bake for 10 to 12 minutes or until cookies are golden brown around the edges. Remove sheet from oven and let cookies stand for 1 minute; then transfer to wire racks and cool slightly. 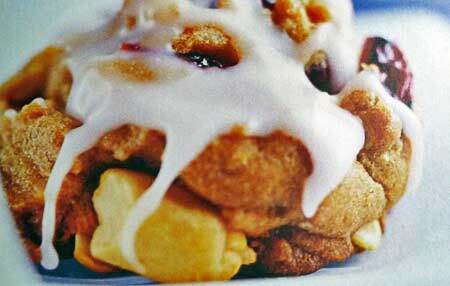 In a small bowl stir together powdered sugar and cranberry juice until smooth. Spoon icing over tops of warm cookies.